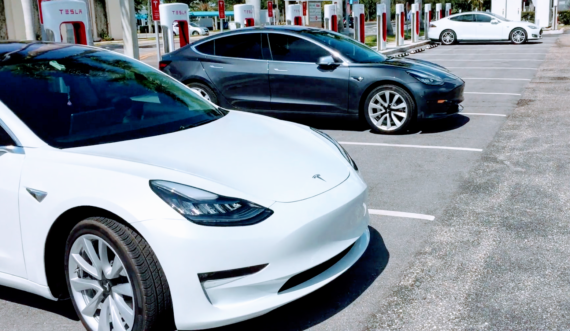 Tesla Model 3 Sales Skyrocket, US Toyota Camry & Prius Sales Plummet — Coincidence? One thing you can notice in that chart, however, is that Tesla Model 3 sales are now dwarfing sales of competing small & midsize luxury cars. The comparison is so lopsided (as are the spec comparisons) that I decided to combine all small & midsize luxury car models for each of Tesla’s competitors. Tesla still won. However, Tesla isn’t taking sales only from those models. Not all Tesla buyers would have been in the market for a luxury car. Indeed, many new owners upgraded from lower cost electric cars, some previously drove pickup trucks (seriously! ), some shifted from sports cars to more spacious sporty offerings, and I would presume that many decided to leave a long inhabited world of high quality but mass market non-luxury cars. Furthermore, the Tesla Model 3 is a top option for people who wanted a green car but didn’t feel comfortable settling for less range than the Model 3 offers and no superfast charging. Many of those people were driving the iconic Toyota Prius — the “green car” of a generation or two. That long prelude brings us to the news of the day. We have long argued that the Model 3 could compete with some of Toyota’s top selling offerings, including the Prius and even the Toyota Camry. If you subtract the cash available from tax credits and rebates and the operational savings from not using gas, a Model 3 can get into the general price range of a fully loaded Camry. Is the hot new model pulling consumers away from Toyota? While it is not definitive evidence, Toyota’s latest US sales report indicates that Camry sales dropped 22% and Prius sales dropped 23% in July 2018 compared to July 2017*. That’s a pretty dramatic drop and isn’t easily explained from what I’ve seen — unless you consider that buyers might now be foregoing Toyotas as they get or wait for their Teslas. In absolute terms, Camry sales dropped from 33,827 to 26,311 year over year, while Prius sales dropped from 9,384 to 7,265. Our strong estimate for the Tesla Model 3 is that sales rose to ~13,500. The small & midsize luxury car market grew as a whole, even in the midst of an ongoing market transition to crossovers and SUVs and the high-volume arrival of the Model 3, so it seems logical that Tesla pulled in quite a lot of sales from other segments, with the Camry and Prius segments being top possibilities. What will happen when the $35,000 Tesla Model 3 gets on the street? What will happen as early adopters who waited in line for a Model 3 years ago start showing their cars to neighbors, co-workers, family members, and friends who only had a vague idea of what Tesla was and why someone would reserve a Tesla car years in advance? You can prognosticate. *Hat tip to Tesla Motors Club forum member ValueAnalyst.